Dinosaur designs; or, What Color is Your Parasaurolophus? I know I’m not alone in this, but dinosaurs may have been the beginning of my love affair with both science and museums. Representations of the thunder lizards in question when I was a child usually ranged in muted shades of green and brown. (Granted, I was luckier than the generation of children that grew up under the notion that Tyrannosaurs were not only friendly and musical, but also purple.) While science has been able to establish the skin textures of some dinosaurs based on a few fossil impressions, the skin colors have remained a mystery. Recent discoveries shed new light on the subject as scientists have discovered a method of determining color on at least a few species of dinosaurs. Most fossils were once something hard – teeth, bones, shell, or another hard substance. Soft tissue doesn’t normally fossilize, although it will occasionally leave an imprint. Fortunately, we know that some dinosaurs had feathers, similar to the birds today that descended from them, with their fossilized remains clearly showing the remains of tough, protein based plumage. Usually, the fossilized feathers are the same color as the rest of the fossil, taking on the characteristics of the minerals in which they were fossilized. Mike Benton, a paleontologist with the University of Bristol in the United Kingdom, thought that if the feathers had been fossilized, the tiny structures inside the feathers probably had been, too. Knowing that in modern birds pigments known as melanin are partially responsible for coloration, Benton thought that the same pigments might present clues to the coloration of feathered dinosaurs. Melanin is stored inside tiny capsules, and each color or shade has a unique shape. For example, black and dark brown shades come in long, sausage shaped capsules; where as reddish hues tend to be encapsulated inside balls, or spheres. Benton chose to study Sinosauropteryx, due to its abundance of fossilized feathers, especially along the tail. Although small, about the size of a turkey, Sinosauropteryx was no push over. Benton describes the dinosaur as a carnivore, or meat-eater, “with sharp little teeth and grabby little hands,” who moved about quickly on two powerful hind limbs. The feathers that ringed Sinosauropteryx’s tail were examined under a powerful microscope capable of looking at the internal structure. Sure enough, the melanin capsules were present, shaped like the ones normally associated with the reddish-brown color affectionately known as ginger. Those reddish bands of feathers may have alternated with stripes of white. This idea is supported not by what was found, but what wasn’t. The alternating colors are suggested by the absence of feathers in between the bands of red. White feathers lack in the melanin capsules, making them much less structurally sound and therefore less likely to fossilize. This works continues research that has been conducted on fossilized bird feathers, including early avian species such as Confuciusornis, with melanin capsules that indicate a variety of colors including black, and an orange-brown shade. 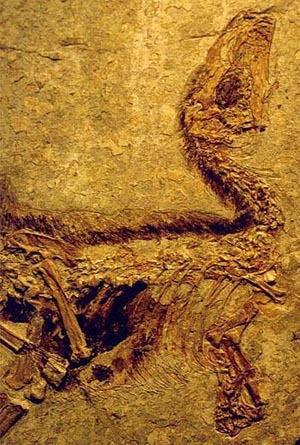 Like Sinosauropteryx, the absence of patches of fossilized feathers indicates that Confuciusornis also had its share of white markings. This method only works with species that have well preserved feathers, although it’s believed that fossilized scales may possess similar clues as to the nature of dinosaur coloration. Researchers may be able to distinguish between browns, reds, and iridescent colors. 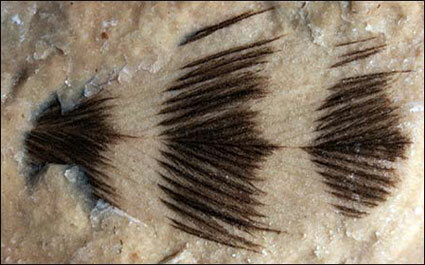 Unfortunately, fossilized scales are very rare and none belonging to a species like T. Rex are known to exist. That said, based on the range of colors that have been established so far, I feel pretty comfortable saying that purple is no longer in the running. 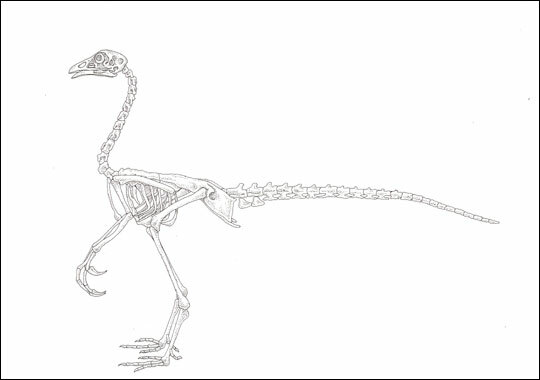 This artist's illustration shows what the skeleton of a so-called "dinochicken" might look like. By working to reverse engineer a chicken embryo to have some of the traits of its dinosaur ancestors, paleontologists are hoping to create a part-chicken, part-dinosaur creature in the lab. Image from Discovery News. A very interesting new dino discovery from China — a four-winged, chicken-sized dinosaur that’s the oldest bird-like dinosaur found to date. Dubbed Anchiornis huxleyi, this find pushes back the age of dinosaurs bearing flight feathers to 160 million years ago. The earlier date — 5 million years before Archaeopteryx, the oldest known bird — furthers weakens the argument that birds did not have enough time to evolve from dinosaurs. See the article in Scientific American for more.